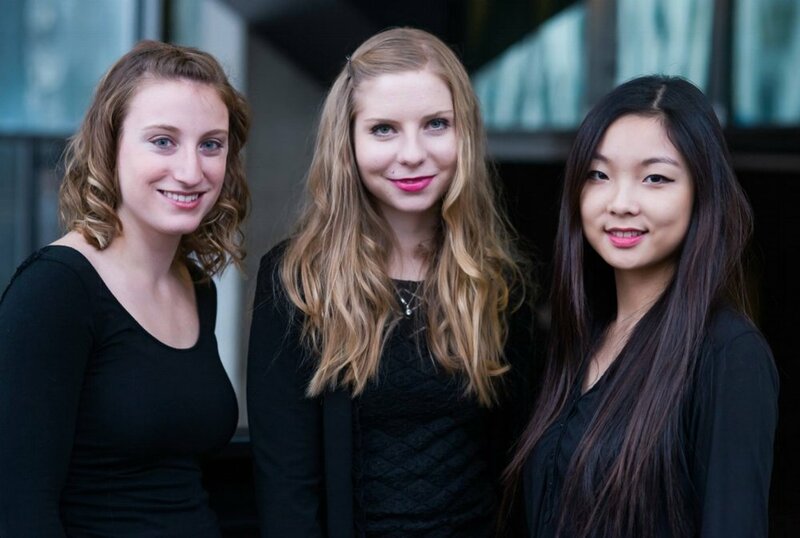 Inspired by Mauricio Kagel’s theatrical work, Dressur, the trio Dressage became whole through the creative, collaborative, and unique process of forming their interpretation of Dressur in October of 2014 at McGill University. The members (Karen Yu, Austin Lamarche, Katelyn King) come from varying backgrounds of culture and education, but come together to champion historical theatrical works by composers such as Thierry De Mey, Georges Aperghis, and Mauricio Kagel. In Spring 2015, Dressage was honoured to work with Jean-Pierre Drouet, who, as member of the Trio Le Cercle worked closely with these prominent French composers to premiere influential theatrical percussion works. Based mainly in Montréal, part of Dressage’s mission is to tour these rarely performed works around the world. Future performances include festivals in Hong Kong as well as schools in China, Canada, and the United States. Dressage was recently awarded second prize in the McGill Sound Recording Competition, allowing us to compile a video collection of theatrical works, including Dressur. The trio will return again to Montréal to perform Dressur at the 2015 Transplanted Roots Percussion Symposium. Dressage hopes to inspire musicians and non-musicians to question the borders between music and theatre, and to collaborate with composers to write new works for this medium. Although Dressage is a relatively newly formed group, we have already commissioned a piece by McGill composer, Zihua Tan entitled Silent Spring, which received its premiere by the McGill Percussion Ensemble in April 2015. Nearly 40 years old, Mauricio Kagel’s masterpiece Dressur (1976/77) has become a standard piece within the chamber percussion repertoire. Originally composed for the group Trio le Cercle, Dressur is written to fit the characters of three very different men: a shy introvert, a spunky outgoing extrovert, and a more dominating controller of the two. The piece depicts the three performers as caged animals in a zoo, putting on a show for the audience. As the music evolves, so does the sanity of the performers, or vice versa. The end result is seeing the performers’ struggle as they fight to find and create a context for their existence on stage. As young women performing the piece today there are two questions we ask ourselves: How does the historical creation and underlying theme (only passed down orally) affect our interpretation? Within this work created for an all male trio, how can we address the problems we encounter as an all female trio, highlight our own assets, and give an accurate interpretation of the piece? Le silence, Les sons Dans la tête. Au dehors. Trois musiciens côte à côte. Trois individus, ou trois versions du même ? Instruments identiques pour les trois. Instruments qui jouent parfois tout seuls, malgré la volonté des interprètes pour leur plus vif étonnement, ou qui servent à modeler des sons comme si ceux-ci étaient palpables. Le mécanisme est ici monté : silence - volonté de produire un son - transmission aux bras, aux mains, aux doigts. Production du son - écoute. Les mains des percussionnistes travaillent parfois indépendamment de leurs corps. Eux-mêmes en sont surpris. Tout ceci donne lieu à des petites séquences tendres et comiques pendant lesquelles des connivences se créent entre les trois musiciens qui modèlent les sons pour lutter contre le silence.